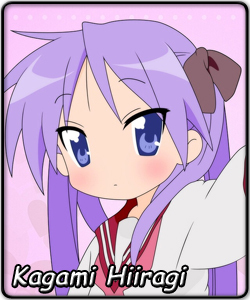 The infamous Tsundere (modern definition - oscillates between the two forms) from Lucky Star, animated by KyoAni, Kagami is the elder twin to Tsukasa and a friend of Konata, and therefore gets the Tsukomi role most of the time. Kagami is a hard worker who gets good grades yet has time to read light novels and dabble in video games. She also juggles her life with being a Miko - family business. She has no romance partner (blame the genre of her series) but she still exhibits Tsundere qualities as a friend to Konata. Out of the 4 core girls she is the only one in a different class, and she frequently visits Konata's classroom on breaks and lunch. She is very conscious of her weight yet she's somewhat ruled by her tastebuds. Just because she is "Tsundere with" Konata doesn't mean she's the one always being teased. Is quite capable of returning the favour, deliciously when she leans on the fact that Konata is a superior otaku in every aspect except for Light Novels - one time she sat down and watched Konata after forcing a book on her with a lovely grin. Surprisingly, she can't do housework but perhaps this is due to having 3 sisters around.